Runnymede is a water-meadow alongside the River Thames in the English county of Surrey, and just over 20 miles (32 km) west of central London. It is notable for its association with the sealing of Magna Carta, and as a consequence is, with its adjoining hillside, the site of memorials (quite a large number). Runnymede Borough is named after the area, Runnymede being at its northernmost point. The National Trust land was donated in 1929 by Cara Rogers Broughton and her two sons. The American-born widow of Urban Hanlon Broughton, she was permitted by letter from George V to join her son's new peerage in tribute to her husband and this gift and be officially styled Lady Fairhaven. The gift was given in memory of Urban Broughton. At the time the New Bedford Standard-Times commented "It must be a source of gratification to all Americans, and especially to us here and in Fairhaven, that the presentation of this historic spot as public ground has been brought about by an American woman, an appropriate enough circumstance considering that the great charter underlies the USA's conception of government and human rights." Visitors reach the memorial by treading a steep path of irregular granite steps, intended to symbolise a pilgrimage. There are 50 steps in total. Each step is different from all others, with the entire flight made from 60,000 hand-cut granite setts. Landscape architect Geoffrey Jellicoe designed the garden; sculptor Alan Collins designed and carved the stone inscription. The area of ground on which the memorial is situated was given as a gift to the United States of America by the people of Britain. (Though property ownership was transferred to the federal government of the United States, the area remains under the sovereignty of the United Kingdom.) It is maintained by the Kennedy Memorial Trust, which also sponsors educational scholarships for British students to attend university in the United States. 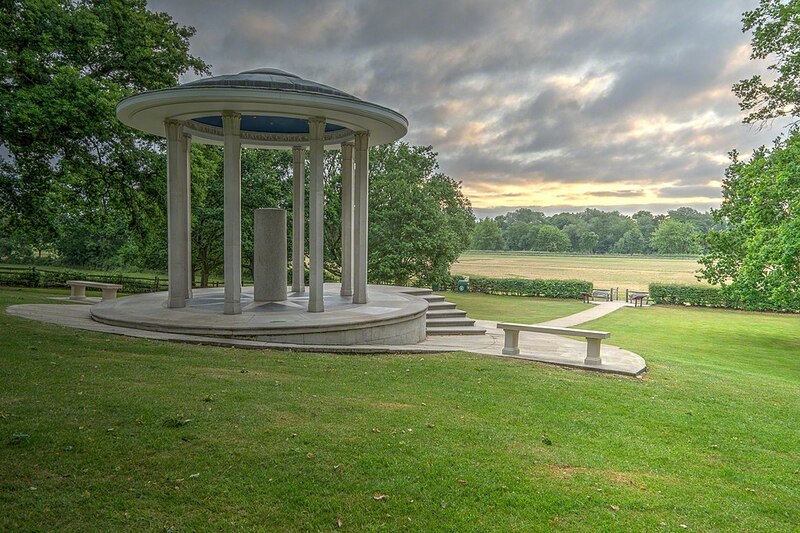 Situated in a grassed enclosure, on the lower slopes of Cooper's Hill, the ABA Magna Carta memorial is of a domed classical style monopteros, containing a pillar of English granite on which is inscribed "To commemorate Magna Carta, symbol of Freedom Under Law". The memorial was created by the American Bar Association (ABA) to a design by Sir Edward Maufe R.A., and was unveiled on 18 July 1957 at a ceremony attended by American and English lawyers. The Duke of Kent together with David K. Diebold, a Minister-Counselor at the US Embassy in London, planted an oak tree adjacent to the Magna Carta Memorial in 1987, as did P. V. Narismha Rao, Prime Minister of the Republic of India. The Prime Minister left a plaque reading: “ As a tribute to the historic Magna Carta, a source of inspiration throughout the world, and as an affirmation of the values of Freedom, Democracy and the Rule of Law which the People of India cherish and have enshrined in their Constitution. March 16, 1994 ”. In 1987 two further oak trees were planted near the Memorial. One, planted by Her Majesty Queen Elizabeth II, marked National Tree Week. Another, planted by John O. Marsh, Secretary of the Army of the USA, has a plaque which reads: “ This oak tree, planted with soil from Jamestown, Virginia, the first permanent English settlement in the New World, commemorates the bicentenary of the Constitution of the United States of America. It stands in acknowledgement that the ideals of liberty and justice embodied in the Constitution trace their lineage through institutions of English law to the Magna Carta, sealed at Runnymede on June 15th, 1215. The Jurors artwork was commissioned by Surrey County Council and the National Trust to mark the 800th anniversary of the sealing of Magna Carta. The sculptor Hew Locke created 12 bronze chairs each of which is decorated with symbols of past and present struggles for freedom, equality and the rule of law. The artist / sculptor invites participants to sit, reflect upon and discuss the themes represented. The back of one of the chairs is a representation of Nelson Mandela's prison cell on Robben Island, South Africa. The portrait on another of the chairs is of Lillie Lenton wearing insignia related to the imprisonment and activism of suffragettes. A large house on Cooper's Hill, overlooking Runnymede and the River Thames, has played a number of roles – as the Royal Indian Engineering College; wartime Post Office headquarters; storage for the Statue of Eros during World War II; an emergency teacher training college; Shoreditch College – a centre for craft and handiwork education – and most recently, Brunel University's design school (which has removed to Uxbridge Main Campus). The revered +1,400 year old Ankerwycke Yew, on the left bank of the river, is also a possible site where Magna Carta may have been sealed. The sacred tree could have been the location of the Witan council and influenced the founding of St Mary's Priory there. This religious site may well have been the preferred neutral meeting place of King John and the barons. Runnymede is 20 miles (32 km) west by southwest of the centre of London. The areas held by the National Trust are open 24 hours and seven days a week at no charge, however parking times on the meades are restricted. Runnymede is accessed via the road or river towpath on foot or by bicycle, or by motor vehicle via the A308 road near Egham about 4 miles (6.4 km) southeast of Windsor. Two car parks (on the A308) adjoin the Windsor entrance (these may be closed in winter due to flooding etc.). The car parks near the Old Windsor entrance are managed by the National Trust which imposes a charge for parking, however this is free for members. The car park at the Runnymede Pleasure Ground further along the A308 at the Egham entrance to the meades is managed by Runnymede Borough Council which imposes a sliding scale of charges. Runnymede lies on the Thames Path National Trail. The nearest railway station is Egham. One of the Lutyens lodges at the Windsor entrance to the meadow houses a popular tea room. There are free designated parking spaces for blue-badge holders and free parking for National Trust members and pay-and-display parking for non-members - cars £1.50/hr or £7/day. There are adapted toilets with level access. There are two accessible-for-all angling platforms. Access to the Magna Carta Tea-room is via steps only (owing to the historic nature of building). Benches are available along the riverside and in the meadows. Braille guide available from the tea-room. 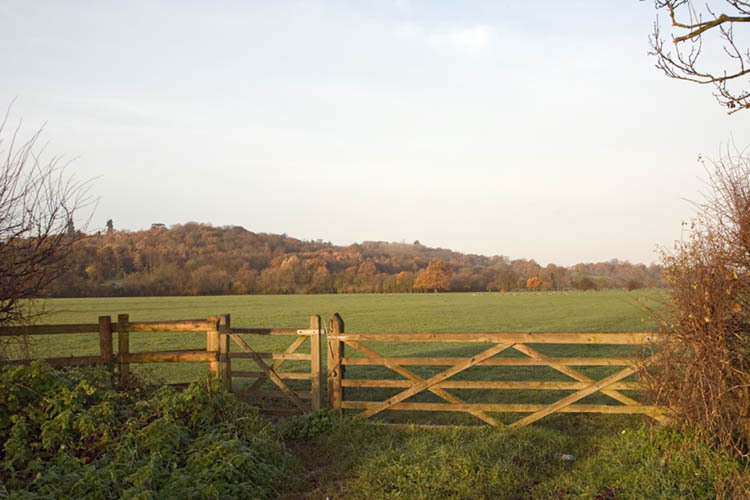 Dogs are welcomed but Bulls may be present in fields - please keep dogs on tight control. Paths may become muddy in wet weather. Transport: Egham (National Rail) then First 8 bus. French Brothers ferry from Windsor. Buses route First 8 stops here. Opening Times: Daily dawn till Dusk. Tickets : Free; see above for car park.